The ancient Egyptians developed a system of writing known as hieroglyphs. The symbols include pictures of things such as birds, people, a mouth and a heart. The Egyptians made paper out of a water plant called papyrus. Scribes—the people whose job it was to write documents—wrote hieroglyphs on scrolls. Egyptian documents include medical texts, stories, love poems, diplomatic correspondence with neighboring nations and religious texts. 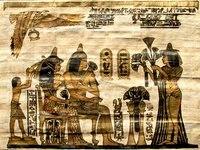 According to Dr. Mike Norris, a consulting educator at freatschools.org, the ancient Egyptians made scrolls nearly 20 feet long out of individual pieces of papyrus and unrolled the scrolls from right to left. Examine some ancient Egyptian scrolls at a museum, in books or on websites. The Metropolitan Museum website offers a selection of papyrus scrolls showing a variety of subjects. Funerary scrolls—prepared for a person who died--showed the ancient Egyptian concept of the afterlife. Make notes and sketches of what you want to include in your scroll. Set out 20 sheets of letter-size paper end to end—you’ll join the top of one page to the bottom of the next sheet of paper. Use fewer sheets of paper for a shorter scroll. Tan paper looks more like papyrus, but white is fine. Use tape to attach the sheets into one long scroll. Overlap the pages ¼ inch, with the end of one sheet resting on the next page. Press tape all the way across the overlapping pages to attach the pages securely. Draw one page of the scroll at a time. Since the Egyptians unrolled their scrolls from right to left, the first page on the right will be the first page of your scroll. Draw pictures of ancient Egyptian life and beliefs, such as scenes of a pharaoh and queen or ancient Egyptian gods and goddesses. Add writings about the ancient Egyptians or a story based on what you’ve learned about life in ancient Egypt. For example, write about how the Egyptians made paper or about King Tut (see Resources). Fill in the drawings with color. Allow the scroll to dry. Roll up the scroll from left to write. Slowly roll the end of the page on the far left and tuck the end under as though you’re making a tube about 3 inches in diameter. Continue rolling until the scroll forms a tube like a poster. Use the cord or shoelace to tie the scroll. Tie it the same way you tie your shoes, and it will be easy to untie it to read it. Use a roll of continuous feed computer paper or banner paper for scroll making, if preferred. Stationery stores carry papyrus paper. You can glue the pages together to create a more authentic looking scroll. This project combines well with a paper-making craft. Older kids can put on smocks and try using fountain pens and jars of colored ink to experience drawing and writing closer to the style of the ancient Egyptians. Handle paper edges carefully to avoid paper cuts. Make your own Ancient Egyptian papyrus paper using paper lunch bags, glue, water and a few other household items.